I know it might come off as bragging when I show you guys the cool things your fellow readers send me, but in all honesty: no one else understands why I get so excited about this stuff. So I have to share. You know, for the geeky moral support. 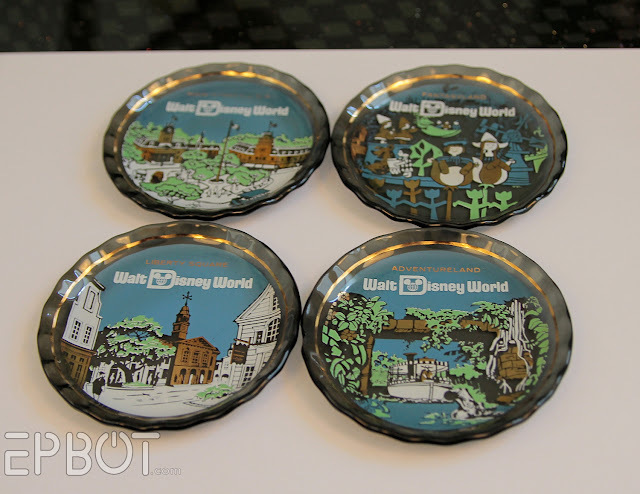 After all, who else but my fellow Dizgeeks would appreciate tiny vintage glass plates from WDW? Misty sent these all the way from Indiana - it's like they're coming home again! They're each about the size of my fist, and are a real bugger to photograph, since they're translucent with lots of shiny gold leaf. LOVE the vintage Jungle Cruise & Small World ones. It's made of tiny seed beads! Janet M., the genius behind this masterpiece, tells me every single bead was placed individually. (!!) She didn't tell me how many hours it took, and frankly, I'm afraid to ask. Janet, I want you to know that something on my office walls is getting the boot to make room for this. It's next to my monitor right now, but I sense some office redecorating on the horizon! 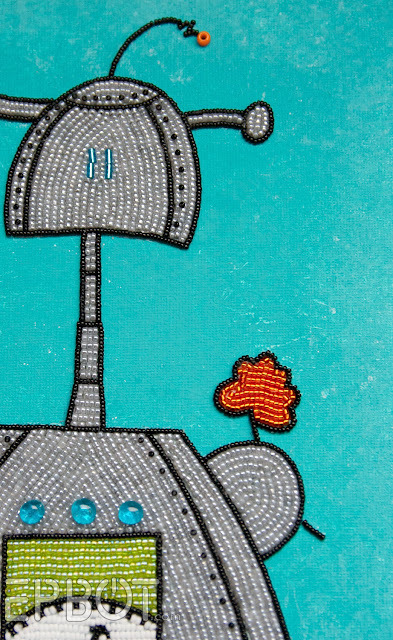 Janet is both a kindergarten art teacher and an artist, so you can see more of her beaded beauties at her etsy shop, and her clever classroom art projects over on her school blog. First, some quick background: reader Diane e-mailed me last week for my address, saying she'd spotted something at E3 (the big video game convention) that she thought I might like. "Ohhh, do you think it's the ears? WHAT IF IT'S THE EARS?! That would so soooo awwwwesome. AAAA!! But, no, I'm not going to get my hopes up. It's probably not the ears. I'm sure it's something else. I mean, it's just sweet that she thought of me, right? Right. Of course. Whatever it is will be nice. I hope it's the ears." John, meanwhile, had NO idea what I was going on about and so was giving me a panicked look of pure terror. Which was kind of awesome. [KERMIT FLAIL] [PEE WEE HERMAN SCREAM] AAAAAAAAUUU!!! 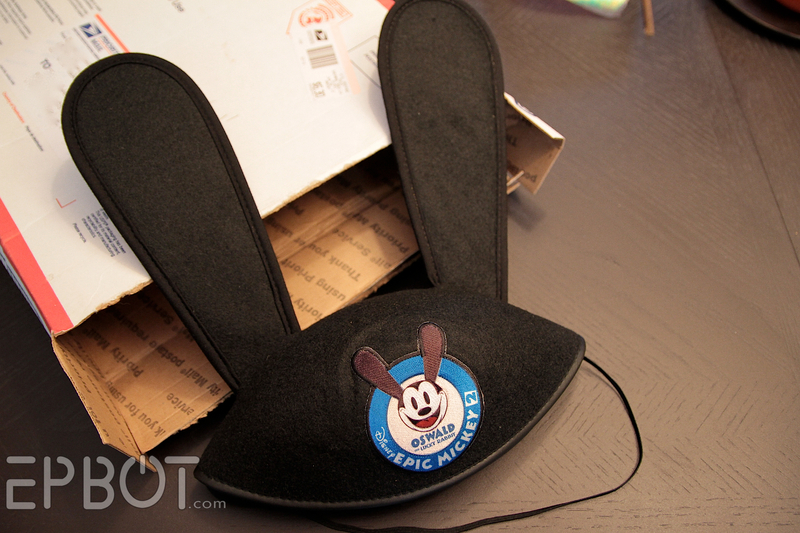 In case you were wondering, these are the exclusive Oswald ears that were only available at E3. 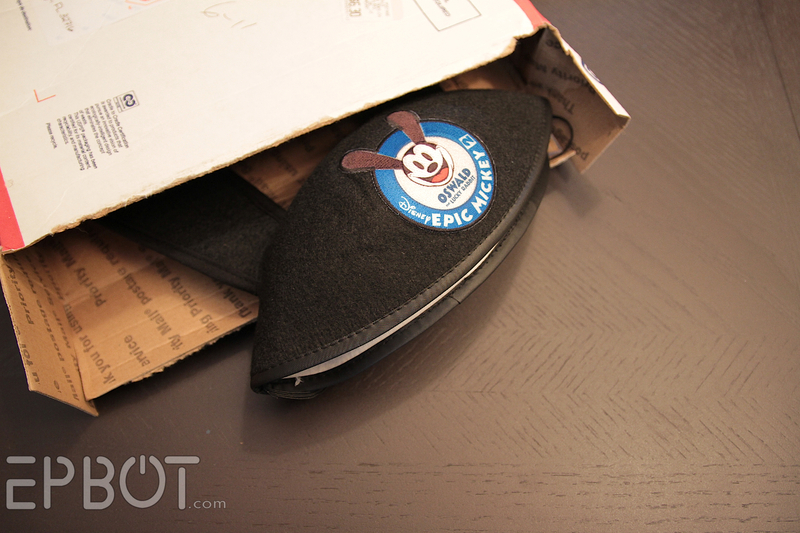 They were being given away to promote Epic Mickey 2 (which I can't wait to play), and I am *amazed* that Diane managed to get Epbot embroidered on them, since the parks have a very strict policy about only putting actual names on ear hats, never nicknames or company names or whatnot. All flailing aside, though, it's the sweet notes you guys send me that mean the most. I keep every single one of them - e-mails, too! - and store them up like Scrooge McDuck with his money vault. Not sure I'll ever swim in them (helloooo, papercuts!) but they really do get me through the rough times. I knew you would love those coasters! :D So glad to send you a ray of sunshine! That is really awesome. Our little Epbot community is the best! I love the ears! OMG! the plates are awesome, and so's the beadwork, but the ears.. the EARS... THE EARS!!!! I have no words, except I'm totally stoked for you and supremely jealous all at the same time!! 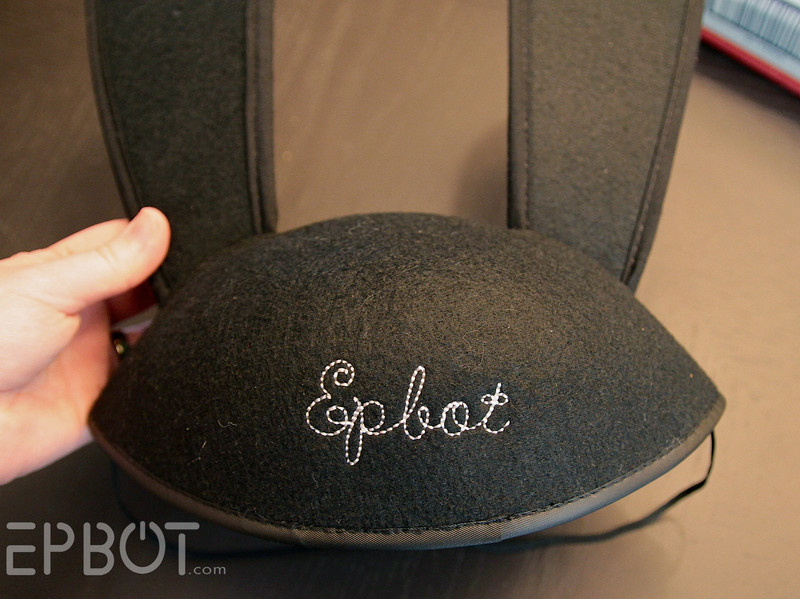 As a fellow former cast member, the VERY FIRST thing I thought of when I saw the Epbot on the back of the ears was "how did someone get away with that?!" I'm very curious as to the story behind that. 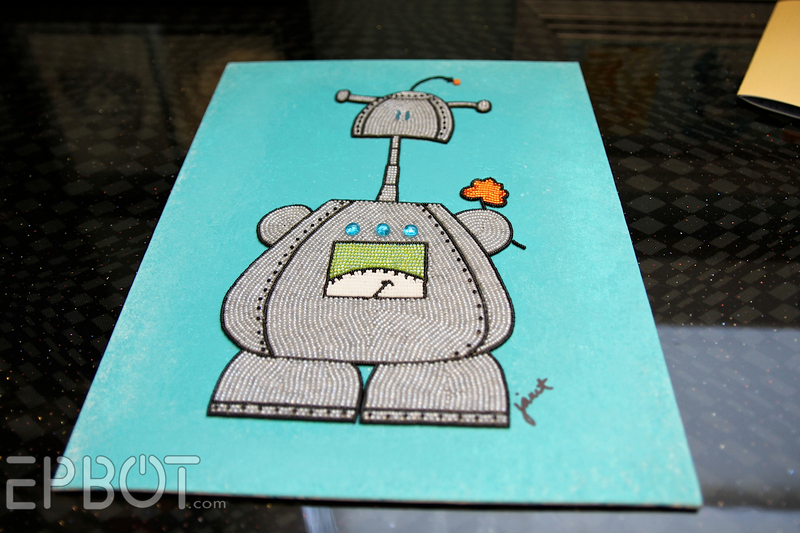 There are no adjectives sufficiently adjective-y to describe that Epbot robot. I'll have to settle for spectacular, knowing it doesn't do it justice. Wow. Every bead is perfectly placed. Wow. Such great goodies and such fun (and envy :) when you share them! thanks for letting all of us see them! Oooh, that beadwork is AMAZING! There's an entire VW Bug covered in beads at the DIA (Denver International Airport)but it's all native american things. Also, You would look adorable in those huge ears!!! I had to add to the sunshine, maybe, in my own way. Jen your blog inspired me to attempt my own, your words make me giggle when I'm having a really down day (I just recently buried my grandfather), and your projects are inspiring. for the same reason, 'staxia' doesn't surprise me that it went through - I like that as a name! I don't get this excited about my own mail and deliveries but can't wait to read about your mail whenever you post! I LOVE the whole bounty! The ears are AWESOME but I'm also eyeballing those shiny gears. Jen, I love your unabashed enthusiasm! It's amazing and encouraging in a culture that so often seems to value sarcasm, apathy, and distance. Keep being your awesome geeky self, for all of us other geeks out there! SQUEEE! So full of squee. Srsly. 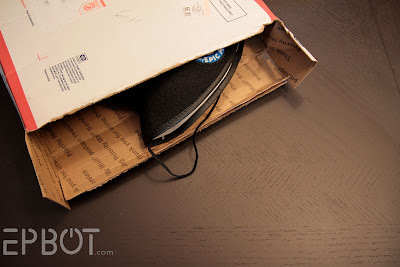 Maybe this is a dumb question but how do we find out where to send you stuff? Just...askin. You can go ahead and ask! The robot took about 10 hours to bead, and was a lot of fun! I'm glad you like it! I have tortured some of my older students (I teach K-4) how to do this with larger beads (of course!) and while a few of the do not enjoy it as much as I do, most of them love it and will sit there for hours quietly working! But seriously, I'm starting to get mad at Sharyn. *frowning, hands on hips* She rhymes. She's funny. She's clever. She's buys exactly the right gift. I bet she is very pretty and skinny, too. Hate. HATE. Ok, not really. Sharyn -- you rock, girl! And thanks for sharing, Jen. what totally awesome gifts to get from your FANS!! Yes, we are!! 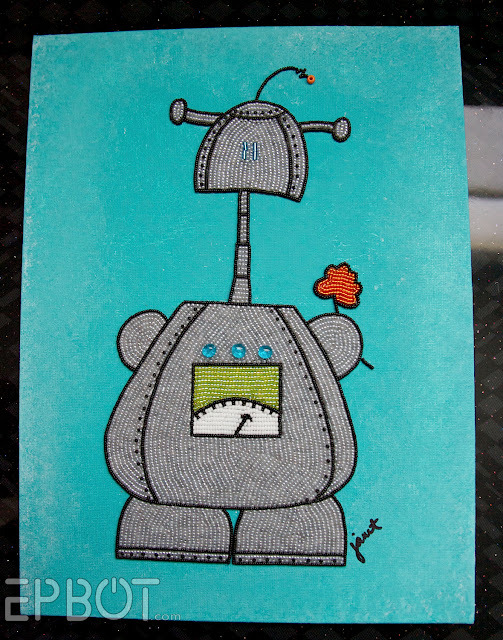 The embroidery can be simply explained -- you have a fan at the embroidery machine. The moe bot world conquest continues. I got myself some Mickey Ears this year for my birthday that say "Time Lord" on them. The park was totally OK with using a nickname, but it has to be something Disney. Which, ahem, doesn't actually include "Time Lord", but I convinced him it was an inside joke. My children may or may not have witnessed my lie. I am a terrible mother. (But a really cool one.) Here's a picture of my ears. Also, all of the other gifts you received are GORGEOUS! Those vintage plates look so cool! And that beaded art is simply amazing! Jen, you are awesome in your writing, your mad crafting skills, and most importantly - your spirit. You deserve the adoration, so enjoy. @ afrancis - Sweet! I'll see you there! All very cool gifts, but I _need_ to know where Sharyn got those gears! I've some steampunk jewellery inside me just bursting to get out and gears like that would help so much. So, Sharyn? You know what you must do now? Of course you don't want to but I'm afraid it's required. You must post a picture of you in the ears. Your readers need it. Last December we were in Disneyland and I fell IN LOVE with the Kermit ears I saw people wearing. But I kept telling myself I didn't need them, I was a big girl and I could still have fun without them. I can't tell you how excited I was when my Sister in Law was handing out hats to the kids and said,"Aaaaaaaand one more!" and handed me the Kermit ears, with my name on them and everything. Obviously much easier to get than your new awesome ears but still they make me smile every time I look at them. I'm proud to say that Janet has taught all 3 of my kids art for the last 7 years! She is wonderfully talented as an artist and a teacher! Thanks for sharing her with the world! @Heather M -- Actually, I made those gears, but they probably wouldn't work for jewelry -- they're between 1" and 4.25", on heavy duty craft foil. They were made on a Spellbinder's Grand Calibur Die Cutter and Embosser, with Spellbinder's Precious Metal craft foil, using the "sprightly sprockets" dies. You can get it all on Amazon, or I got the machine and the dies at Hobby Lobby -- the coupon works, so you can get them for 40% off. For jewelry, check the Explorer line (green packaging, next to Vintaj, which has all kinds of cool stuff, but I don't really like their gears)at Hobby Lobby -- it's often 50% off -- like this week!!!! They sell a bag of gears that are jewelry quality. Michael's also had something similar in the Bead Landing line, but I haven't been able to find them in a while. You can also get gears in the scrapbooking aisle, but I've never known if they were OK for jewelry -- Tim Holtz has mid-sized ones, and I just started finding packages of smaller ones in his line. Hobby Lobby has it's own knock off line of the larger Holtz ones, too. 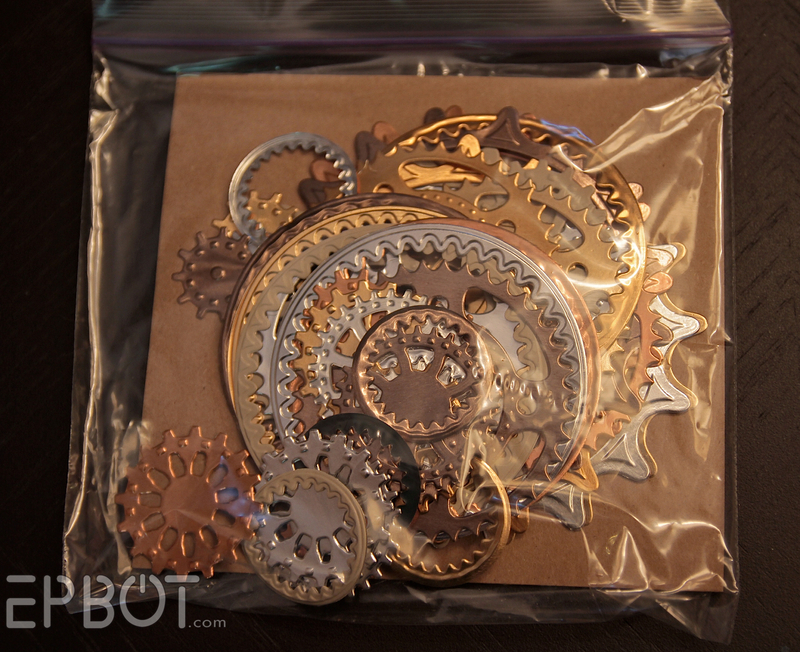 For really cool tiny gears, Lisa Pavelka (I think) sells packages of gears scavenged from watches. You can get them on Amazon, or Hobby Lobby has them in the clay aisle -- again, not sure if they work for jewelry, sometimes watch parts have oils on them. The little gears are really cool, but not cheap -- about $11.00 for 1/2 oz., but the Hobby Lobby coupon helps. I've also been pleasantly surprised with some of the gears I've found an Amazon, but others were just pressed foil. One human can't have the awesome of both the ears and those amazing plates. I'll be happy to take the plates off your hands. "Helloo papercuts!" in the "Hellooooo nurse!" Animaniacs voice? Please? please please please please please??!? AHHHHH... ALL THE FEELS! OSWALD EARS! MY WHOLE BRAIN IS CRYING! Thanks Sharyn. I'll keep an eye out for some of your suggestions. I live in Canada so don't have access to a Hobby Lobby, but Michael's is here. My type of jewellery doesn't need them to be very sturdy. They'd be incorporated into embroidery. I've got to get working, I have so many ideas bursting to get out and not enough time! Turn Any Fat Frame Into a Shadowbox Frame! Bubble Wrap Bracelet: Rainbow Shells! Icy Earrings From... Bubble Wrap? !